Whenever new slots from Microgaming are released, we’re always curious to have a look at what the leading software developer has come up with now. In this case, it’s the Jungle Jim El Dorado slot, and let’s just say we loved what we saw. Want to know more? Of course you do. 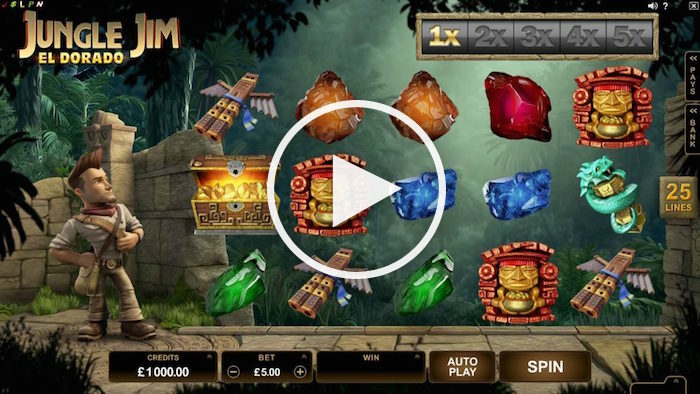 The Jungle Jim El Dorado slot is a 5 x 3 online slot from the ever-reliable Microgaming stable. This is a very appealing 3D slot too, with the title character, Jungle Jim, standing on the left as you play. While the game has five reels, they’re suspended invisibly on the screen. As you spin, everything currently in position drops out of sight and new symbols drop down from above, so nothing really spins as such. The game itself has managed to achieve the nice balance of offering some appealing features – a little bit more unusual in some respects – and yet it isn’t complicated to understand. A few spins on the free-play version and you’ll see just how pleasant the game is to play. For our money, the Microgaming Jungle Jim slot is also one of the best-quality 3D games we’ve seen in a while. Top marks for that too. We’ve already mentioned how good the 3D element is when you play the Jungle Jim El Dorado slot. The whole thing has an Indiana Jones feel about it, and they’ve spared no effort in creating the various symbols either. Our hero is there to watch over progress as you play (but we’d like to know how he has room for that shovel in that small bag of his). You can adjust the number and value of your coins in the bet panel. The autoplay and spin features are self-explanatory, and your credits and win amounts are also easily displayed. There’s a tiny tab on the right of your screen that says ‘pays’. It slides out and provides you with three pages to view. Take a look before you play the game. The first page shows a mystical circular symbol as the scatter, and the Jungle Jim logo as the wild. The standard symbols include several different-coloured gems, as well as idols and a treasure chest filled with gold. Five of these chests unlocks the biggest single prize in the game. The value of the prizes alters as you adjust your bet amount below. Usually the latest Microgaming slots are packed to the rafters with in-depth features. Will this be the case with the Jungle Jim El Dorado slot too? Firstly, there is the Rolling Reels feature. When you achieve a winning combination, the relevant symbols that won you the prize will explode and new ones drop into place. The multiplier value at the top of the screen will also increase by one position every time you get another win. The maximum increased multiplier is x5, so there is a good chance of getting bigger consecutive prizes if you’re lucky. The x5 multiplier applies to the fourth and subsequent rolls you might achieve. But that’s just in the main game. 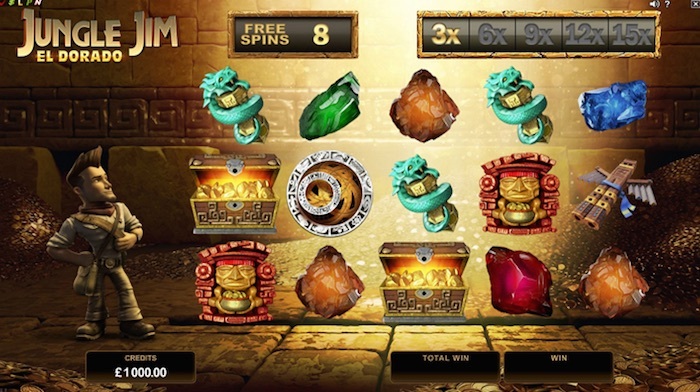 the same feature is also present in the free spins feature. You win your free spins – 10 of them – by getting three of those circular scatter symbols at once. 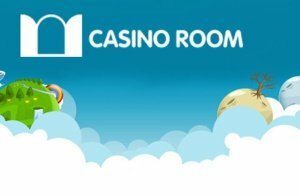 You can also retrigger those free spins while you’re playing them, so there is a chance to get some seriously good prizes from this round. Let’s look at how the multiplier works in the free spins feature. Basically it works the same way, but the multipliers that apply when you get more than one consecutive win will be bigger. Instead of going through x1, x2, x3, x4 and x5, you start with a x3 multiplier and then progress as follows – x6, x9, x12 and then x15 for good measure. You can probably start to see how the really big prizes can be won in this game. You only have four coin values to choose from here – 1p, 2p, 5p and 10p. You can however play between one and 10 coins on each of the 25 lines in play. That makes 25p the smallest bet you can place and £25 the biggest one. That’s a fair bit smaller than top bet amounts for other slots we can think of. The paytable reveals it’s possible to win up to £92,000 with this game – that’s if everything falls in your favour with the Rolling Reels and the Multiplier Trail, and assuming you make the maximum £25 bet. The maximum multiplier is 3,680x your stake. You can expect an RTP over time of around 96.31% according to research. Can you tell we really liked this game? On the face of it, the Jungle Jim El Dorado online slot doesn’t have too many special features involved. But when you take a closer look, you realise the features it does have can really work in your favour if and when you get several consecutive winning combinations. You’ll find yourself waiting for those free spins to be triggered, so you can enjoy a chance of getting bigger and better prizes as well. Give it a try now and see how much you might enjoy it.